Born on March 28, 1991, Iyinoluwa Samuel Aboyeji, more popularly known as “E”, is really just another overtly optimistic 19 year old itchy for a gale of change in Nigeria. 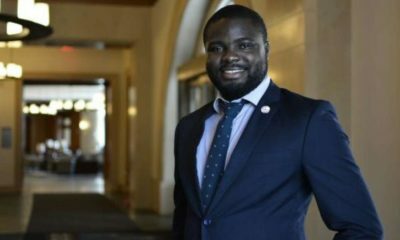 He has served in various leadership roles within several local and international organizations, including the World Youth Alliance, Imprint Publications, Harambe Africa and Empowerment Squared. Recently, he has co-founded Bookneto, an online initiative which promises to be the world’s best study tool. 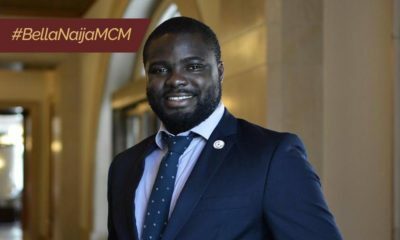 In this insightful interview with BN Editorial Assistant, Gbenga Awomodu, “E” talks passionately about education, Nigeria, and Bookneto, his latest project. 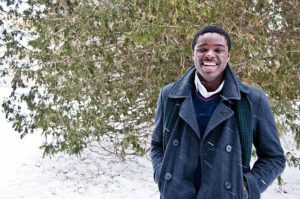 I am a young Nigerian – 19 years old – studying Legal Studies and Economics at the University of Waterloo in Ontario, Canada. I was born and raised in Nigeria and graduated from the Loyola Jesuit College, Abuja, Class of ’07. I am very passionate about development economics, publishing, international advocacy, Nigerian politics and technology, amongst a lot of different things. Presently, I am working on a project called Bookneto that is sure to change the face of education. Why did you choose to have your university education in Canada and for how long have you been there? I have been in Canada for all of 3 years now. I chose Canada because it still has a very young educational system with much more academic freedom and experimentation. One particularly interesting thing that drew me to the University of Waterloo in Canada is the co-operative education system, which allows you to go to school for one semester and work the next semester, as part of the degree requirements. It enables you to apply what you have learnt in class in the real world, while building a formidable resume and earning some money in the process. Schooling here is also slightly cheaper than in the States or elsewhere, without a huge deficit in quality of the programs. What has your experience been like studying in Canada? It has been just fine. One thing I love here is their emphasis on real world experience. Just going to school in some sort of gated communities (like how they do in Nigeria with schools like Covenant, etc) is a death sentence here because all your employers expect you to have a beefed-up resume before you finish your first degree. The schools realize that and do everything they can to find you experience. Industrial Training is every other term, meaning: five IT’s before you graduate. How will Nigerian graduates, who hardly have more than two, compete with graduates like these in the local economy? In almost every school, there is a career action centre that helps with resume writing and finding jobs while you go to school. Also, there is a very close relationship between schools and business. Right next to our Campus at Waterloo is that of Research in Motion, the company that produces the BlackBerry Smartphone (whose messenger application I know Nigerians are crazy about). Many Waterloo students work there on their co-op terms and gain lots of useful experience they can put on their resumes. The companies here maintain an ecosystem that gives them access to some of the best Research and Development in the world from the Universities. It’s a system Nigerian businesses might want to adopt to do wonders in talent acquisition and retention, and reduce high cost of R&D. Finally, there is an emphasis on ‘doing’ here. In Nigeria, we talk too much and we depend on government for everything. Here, if you haven’t done anything, no one will listen to you. The worth of your words is directly correlated with how much you have done in your life. Have you encountered any major challenges and how have you overcome them? The Canadian system has its own problems, just like other countries. The system is largely publicly funded so there could be a standards issue at times. Since the government just wants its citizens educated, there might be issues as to whether certain students deserve to be in the University or not (as University placements are a political issue, rather than a merit issue). A side-effect of this problem again is crowded classes. It is a lot better than Nigeria though, but sometimes you wonder about the value of attending lectures where there isn’t a lot of time to really concentrate on critical material or ask much more introspective questions. There is also the somewhat moot issue of discrimination. It hasn’t really registered in Canada that Nigeria is an English-speaking country so they keep asking you for annoying English tests. If you know your stuff though, it isn’t that big of a deal. As for overcoming challenges, given my Nigerian educational background, I have mastered the art of studying on my own so it is very easy coping in class. However, there are a lot of students who struggle with the class material because they are not getting the help they need. Bookneto is actually one of the tools that might really help institutions and students facing such problems. You recently started Bookneto.com in partnership with a friend. What is Bookneto all about? Bookneto is about entirely changing the world of education by combining easy access to academic material and resources with the power of social networking to help students interact and study most effectively. It is one of those things that are very difficult to explain without seeing so I am just going to say, make sure to sign up on our website so when we launch we can show you the world’s best study tool. What inspired you to start BookNeto and what was your experience like until you eventually uploaded the site? We haven’t launched our product yet so you might have to wait just a couple more days for that. What inspired us to start Bookneto was our concern for the student learning experience. We realized from personal experiences that the system wasn’t working. Students did not have the freedom to study as they should: with constant access to course material, without an overbearing content wall, with the help of teachers who care about their learning process and within a knowledgeable global learning community. We thought that the advent of the internet will change education just as it has changed so many other things, but it seems the educational system just moved the same problems online and even further complicated the issues (see online-for-profit Universities, for example). Bookneto was formed as a student response to the many problems with the education system. It is certainly not an easy thing to do, especially with school and other commitments in tow. We sought out students, staff, professors, publishers and did a lot of research, and we are not even done yet with receiving feedback. It has definitely been an amazing and impactful experience. Working with some of the most talented people I know gives me strength to work harder and press forward with Bookneto. It has been a joy working with very experienced and competent advisors and mentors. What other similar initiatives exist and in what ways is BookNeto different? The social learning space is quite competitive and we have learnt a lot from what many consider “similar initiatives”. I can confidently say that Bookneto is very different from all the “competition” in this space – we have a student focus. Many other companies consider their clients to be professors, publishers or schools, and primarily market their products to those clients. We think these stakeholders are important, but are dependent on their relationship with students. At Bookneto, our primary clients are students. Every day, we ask ourselves, what can we do to help students study better and more effectively? How do you hope to address (complex) copyright issues and eventually make Bookneto a profitable venture? Amazing question. While others see copyright as the problem, we are looking at copyright as a wonderful business opportunity. The assumption underlying our revenue model is that students will be willing to pay for ease of access to academic material/content they need as well as the tools that will help them effectively study with these materials. We are working with students, professors, textbook publishers and authors, not only promoting content sharing as a profitable activity, but also offering publishers some of the world’s best technological and social defences against piracy. Our current research and forecasts show we can make up to a quarter of the current annual revenue of some of the biggest textbook publishers, with barely 10% of our North American student target market on board at prices that help students save 50%-75% of their current textbook costs. Most importantly, publishers get some amazing analytics with respect to what aspects of their content are most useful to students so they can improve their offerings while textbook authors are able to build reputation and relationships by communicating directly with the student audience for their textbooks. What obstacles do you envisage in deploying Bookneto and similar internet-driven initiatives in developing and third world countries? The obvious problems are internet access and lack of appropriately priced hardware for a web application like Bookneto. But again, I like to look at these “problems” as opportunities for Bookneto. For example, I am pretty sure Internet access in Nigeria is set to yield some of the biggest returns the world has ever seen. 44 million Nigerians are already on the internet with slow 54kb modem connections Starcomms and other telecoms companies manage to dash us every now and then. Imagine what will happen when there is really fast and cheap broadband. Hardware companies like Zinox and Encipher are breaking grounds by launching cheap laptop, netbook and tablet hardware options. The developing world market is rapidly ripening for web applications like Bookneto. People who overestimate these “obstacles” are definitely making a big mistake! What establishments have you worked with and what leadership roles have you played in the past, both locally and globally? Well, this seems like one of those brag questions I like to avoid. I’m going to say I have worked in and with many amazing global and local organizations that I am proud to have learnt a lot from. If you really want to know, you can check out my LinkedIn profile. What are your future plans, especially after your first university degree? It’s very difficult to be certain about things like this. I’m still praying. However, I think I will be with Bookneto for a while, depending on how things turn out over the next year. The entrepreneur lifestyle definitely appeals to me and I hope I can change the world by making products and services people cannot live without. One thing for sure is that if all goes well, I hope to return and tap into the bundle of business opportunities Nigeria is by being a super angel or venture capitalist focused on young Nigerian entrepreneurs. How can BookNeto be useful to Nigerian students and the Nigerian government? I can’t say how Bookneto will be useful to the Nigerian government primarily because the product wasn’t built with them in mind (I can’t wait to see how they might want to use it though…to retrain civil servants?). However, while we are primarily operating in North America for now, Nigeria is a huge potential market for us. We know Nigerian students are self-motivated learners and if my memories of Nigerian education do me any justice, we pretty much thrive on cramming large portions of textbooks. The trouble with these textbooks is that most of them are out of date and new editions take some time to reach our shores, not even considering exorbitant shipping costs, plus the extra booksellers will put on top. With Bookneto, all you require to access the latest academic content is an internet connection and a subscription. Also, Nigerian students will be able to tap into a global community of students and better-trained teachers when they have trouble with important academic concepts. This will reduce the impact of unqualified lecturers on students’ learning experience and also highlight the effectiveness of Nigeria’s best teachers. Ultimately, Bookneto will afford Nigerian students the kind of education that will adequately prepare them to participate actively in a highly competitive global economy. What are some of your thoughts about Nigeria and do you plan to return any time soon? Nigeria is an economic miracle waiting to happen; the economic facts reveal it. I am confident that, somehow, sometime soon, “UP NEPA” will be a thing of the distant past. We are moving quickly from the days of recycled military men in borrowed Agbadas to younger public intellectuals with relevant leadership and policy credentials. Also emerging are young and savvy Nigerian entrepreneurs whose creative engagement will yield much of Nigeria’s progress in the next decade. I don’t think government can or should create jobs for young people, especially because these “jobs” are rarely meritocratic, thanks to a unique combination of our ‘federal character’ and ‘arrangee’ system. The government should make it easier for young people to do business in Nigeria. As for my coming back to the country, it is only a matter of time. Even if I was a foreigner, it would be stupid for me to see all the amazing market opportunities that exist in Nigeria and not, at least, keep an eye on them. I just need to learn as much as I can here so I can bring home some badly needed experience and capital, instead of a looting bowl and an empty belly. Any other thing you want to tell our readers? We are coming. Nigeria is coming. Young people are coming. Iyinoluwa blogs at iyinoluwa.posterous.com and you can access his LinkedIn profile here. 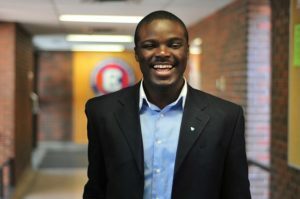 Gbenga Awomodu is a freelance writer and editor. He blogs at Gbenga’s Notebook!, a repository of his thoughts and other works. He is 19! and too smart for his age…trust me! I know this guy. He would blow your mind away when you listen to him talk; you begin to imagine, “who the heck thinks so deeply”…. “Nigeria is an economic miracle, waiting to happen” Exactly my thought! Could the Nigerian government please create an enabling envirornment for us? Example SECURITY.The younger Nigerians are poised to change that country.The days of everyone waiting for civil service jobs will soon be a thing of the past.Private participation is very much needed.Our government should also set standards and regulations, collect taxes efficiently from these private enterpreneurs and manage resources well.Exactly why we must vote wisely and put the right people in office.Do not vote because the candidate is your brother or sister but because they can deliver. i usually dont post comments and all, but from what i hear this guy saying i just had to say something. i am proud of him and also proud to be Nigerian. YES WE ARE COMING!!! Up Canada! Yeah, we are coming! Up Nigeria. Let’s go there. My heart leaps for joy when I see young people taking up challenges and being drivers of change. E, keep doing everything it takes to realize your dreams. The world is watching. Really? Are you sure he is only 19 years old? He sounds so mature and knowledgeable. I’m impressed. Kudos to you and all the best. At 27, I feel pretty unachieved.This guy has given me another assignment in life, he’s sure going places. More of you in our decaying economy! Am with Iyinoluwa, we are truly getting there!! You sound so smart kudos bruv.. He looks like a really happy person. Very inspiring and impressive. Way to go! Hey ..wondering what you know abt Covenant. my dear last i checked http://www.iwantairplay.com is run by an ex-Babcock student o…. Why is this post on BellaNaija? I can’t understand, what about the hundreds of youths in Nigeria and in the diaspora starting stuff everyday, and actually making progress. This bookneto website barely relates to Nigeria and it hasn’t even started and you are featuring it on BN? I’m impressed by the young man’s comments but actions have always spoken louder than words so please feature initiatives THAT ARE ALREADY MAKING CHANGE, or better yet, feature bookneto when it is actually DOING SOMETHING. I’m sorry but this guy obviously doesnt know what he’s saying. How can it help the Nigerian govt?..and all you can say is insult civil servants??? ?you need to train your mouth boy!..and what do you know about universities in Nigeria, I did my undergraduate degree in Nigeria and by the time I graduated I already had 4 internships, so dont go around saying what you don’t know!Bookneto sounds like a good idea and i hope its purpose is fulfilled , just ensure you do proper research next time before coming to put down people in ur interviews, unless you wont be getting no interviews anymore baby! Good luck and God’s guidance, but don’t screw your chances of making your creativity a tool in the hands of the government because let me tell you personally, if the govt doesn’t approve, there’s no way its gonna be working for you in this nation. Please take it easy ….He obviously still has a lot to learn about speaking but haba he is just 19!Age has a way of taking care of such utterances. How many 19 year olds have achieved this much.He should be commended for being a source of inspiration to young people. I shouldn’t comment on this but I just wanted to correct a perceptions thing I noticed in the comments. When I said “retrain civil servants” I did not mean it as an insult to civil servants. If you look at companies like Safari Books Online which are in our space, they are used to help retrain and refresh the skills of corporate employees at some of the Fortune 500 companies. I think Nigerian civil servants would benefit from the kind of resources a Bookneto in Nigeria would be able to offer them. I just wanted to point out that my intent was not to insult the government of Nigeria or its employees but to point out a possible market opportunity. You sound like an articulate young man, and I’m glad you came back on to defend yourself, but that was unnecessary. Anyone who is/was an observer of the civil service in Nigeria recognizes that majority of our civil servants are in a rut. One could call them resistant to conventional attempts to keep them abreast of new developments so yes, retraining is an appropriate term to use. When a person says “don’t screw your chances of making your creativity a tool in the hands of the government because let me tell you personally, if the govt doesn’t approve, there’s no way its gonna be working for you in this nation”..while you should take heed to the first part, ignore the second. Such people do not understand the power of the private sector and capital. Brilliant. i just so admire you. 2018 and see how far you have come man…Truly mind blowing. Do you write codes too? So you ignored everything else he said and wrote a mini-essay on the 2 sentences he said about English tests in Canada. As for comparisons, when countries have models to follow and as much resources as we have, it’s not absurd to believe we should be ahead of where we are now. Don’t throw out the baby with the bathwater…the dude made a lot of sense. In essence I would like to point out that this child has had little experience in the Canadian society, has failed to do research on the Canadian and Nigerian institutions he mentioned. Yes, he made FEW comments that made sense but that does not make this impressive. Its sad that you do not understand what you have read and are quick to hail it because he is a student abroad with something to say. What evidence do you have to support any claim he has made about the societies that you have no knowledge about? Societies I have no knowledge about? I’m Nigerian living in the U.S. getting a Master’s in international political economics and development. Included in this is comparative political economy…which means I get to compare industrialized economies and developing economies including Canada and Nigeria. Some people sha…una too dey jump. For your mind you sabi everything. Comot for road and let the boy breathe jo. The reason why Canada is about 200 years old and Nigeria is “50” years old is because Nigerians started documenting events when it became an independent nation. Way to go Iyi! I completely agree with you that there is a market in Nigeria for your business idea. On some of the comments made: I can’t help but say that some Nigerians like to delve into making arguments on issues they barely comprehend. Worst of all is that they don’t recognise their lack of knowledge and try to sit back and further educate themselves on the issue…they are almost always of the disposition that they know more. As a Nigerian with a Masters in Development Economist and a practicing professional, it is important for us as a nation to have a wholistic understanding (academic and otherwise) of our nation’s economic issues before making comments. Until some of us learn to do that, we shall continue to regress as a nation. That’s nice. There is still hope for Nigeria with this kind of mind. I like your mind, E. It’s the kind that sees problems as opportunities and takes steps to provide solutions. When we move from complaining about what doesn’t work to actually taking action, we’ll see the change that we desire. If we all actively seek ways to add value, like E and so many other young people are doing, we’ll see Nigeria transformed in our lifetime. 1daful job , back there sir u ar 2 much , u ar jst 19 nd luk at wat u ve acheived nd impacted on so many people , ‘m jst 16 nd atleast wen ‘m 19 i wnt 2 b sure ‘ve made an impact , pple shuld commend u and luk at d bright side of things rather than criticize u , u ar a blessin 2 our generation , with Nigeria would surely get better , i believe in you , and i believe in Nigeria , we ‘ld get there sooner , 10x bye. So confuse abt ds post,is it an update? wow, Iyinoluwa Aboyeji, i am stupefied, flabbergasted…had to vote you as my preferred choice in the Future Awards 2012, season7,Innovative (Education) category, …young man you are doing great… however do not rely on your oars cuz the sky is not your limit but your beginning..cheers. we need more young Nigerians to emulate such stride. Keep it flying Dude, i got some new insights from the Bookneto idea. We shall unleash… Thanks for sharing. Fantastic one, E! Brace up earth, more stars are rising in Nigeria. I hope all those that commented negatively in 2011 have started eating their words. This is very inspiring.You definitely will go far. This is very inspiring..More grace.Well done. Flutterwave Co-Founder Iyinoluwa Aboyeji is Engaged!